The Exploded View is based on understanding the interrelation between the six levels in the overview. This perspective shows the importance of every single element and the whole. The Exploded View is an effective tool for helping companies navigate an increasingly digital world. 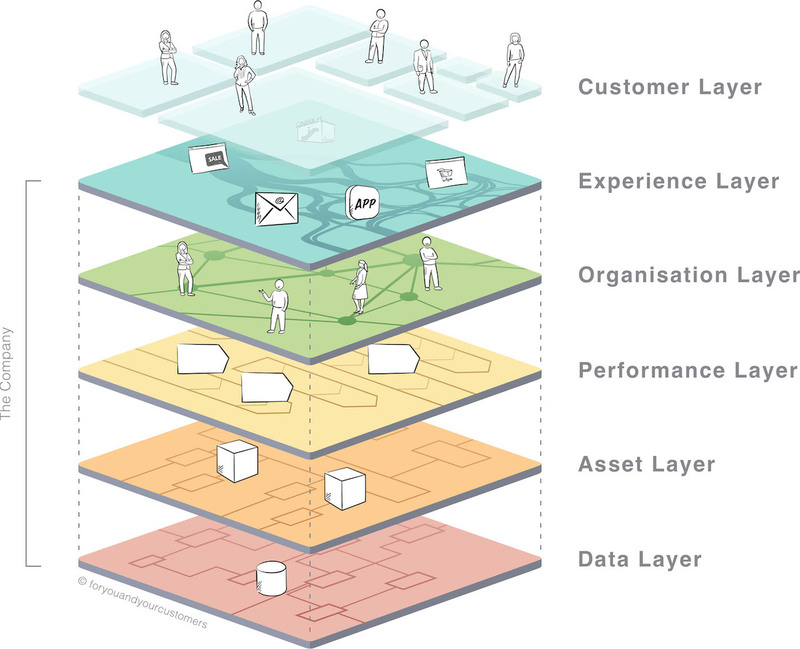 The model is based on six levels. These levels can be broken down into different perspectives and used accordingly – these include the customer, market, company and employee perspectives. In this article, we want to shine a brief light on the company perspective. You can find a detailed description and useful tools for your digitisation projects in our free white paper. The six layers of the Exploded View are able to model each company in detail and with surprising ease. Many relevant contexts for the company’s development can be presented and explained. The process of considering the company as an integral unit begins with the customer and moves ‘downwards’, layer by layer, to the data. The model is based on the concept defined by Artur Koestler and the ‘holon’ described in detail by Ken Wilber. Each element is a part and a whole in equal measure, and the sum of all elements represents a layer. The company perspective in the Exploded View provides a detailed consideration of the organisation and enables its operational improvement. The relevant aspects and the areas in which change is necessary within the company can be named and the roles and responsibilities defined and addressed. This perspective is extremely valuable for many of the stakeholders and permits the emergence of more efficient collaboration. It visualises all six layers of the model and thus forms the basis on which to build a better understanding of the other perspectives. Therefore, it is also the most frequently used perspective within the Exploded View.